Nanny wages have been on the steady increase for the last decade and from 2003 to 2017, the average nanny wage has increased 20%. Paying your nanny a fair wage is part of what keeps her happy and loyal to your family in her role. After all, she works hard for your family all year long and it is important to recognize her for a job well done. One way to acknowledge her efforts, above and beyond her wage, is through a end of year bonus. 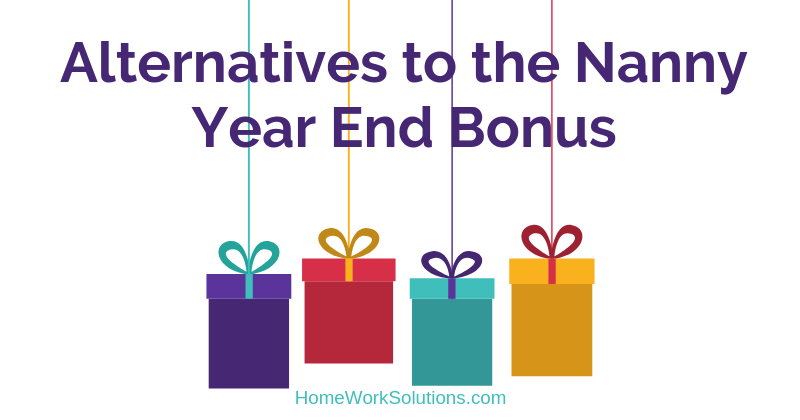 A typical end of year bonus is one or two weeks pay. For many families, paying a nanny additional cash for a bonus could be outside of the budget, particularly if the nanny is well compensated already. If that’s the case, there are several other nanny gift ideas that can work as great alternatives to help recognize your nanny’s work for the year. #1: Unexpected paid time off. Paid time off can be one of the best employee appreciation ideas. Let her have a couple of days off so she can do what she wants. Give her plenty of notice, so she can make plans to visit friends or family. Around the year end holidays, if you need extra hands to help in your nanny's absence, consider enlisting the help of grandparents or a babysitter who is home from college on break. A digital photo frame, handwritten thank you cards, and artwork from the kids are just some of the great personalized gifts that can touch the heart of your nanny and help her feel loved and appreciated. Have your kids get creative with these gifts so it shows that you really put some thought and effort into it. Think of something that your nanny would appreciate but not pay for herself. If she drives your kids in her car, consider having her car detailed. If she loves to travel, think about sharing some of your airline or credit card points to help her make a trip a reality for her. Use your knowledge of who she is as a person to provide a meaningful gift to her that shows how much you appreciate her efforts every day. Nanny appreciation goes a long way and will help her feel valued. A little bit can go a long way to helping build a stronger bond between your nanny and your family!